The Cpl. 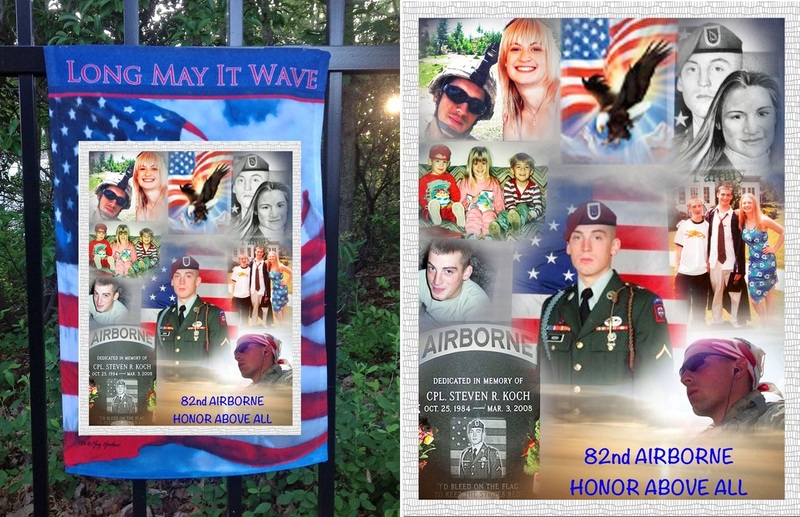 Steven R. Koch Memorial at Our Lady of Lourdes School, 44 Cleveland Ave, Milltown, NJ. Awards and decorations include the Bronze Star Medal, the Purple Heart, Army Commendation Medal, Army Good Conduct Medal, National Defense Service Medal, Afghanistan Campaign Medal, Global War on Terrorism Service Medal, NJ Distinguished Service Medal, Army Service Ribbon, Overseas Service Ribbon, NATO Medal, Combat Infantryman's Badge and Parachutist's Badge. On May 6, 2010 Steven's Beloved sister Lynne C Koch who had deeply mourned the loss of Steven, passed away. May she eternally rest in peace in the loving arms of her brother and best friend. She will be missed by all who knew and loved her. Hometown: Milltown, New Jersey, U.S.
Died: March 3, 2008 in Operation Enduring Freedom. Unit: Army, 1st Battalion, 508th Parachute Infantry Regiment, 4th Brigade Combat Team, 82nd Airborne Division, Fort Bragg, NC. 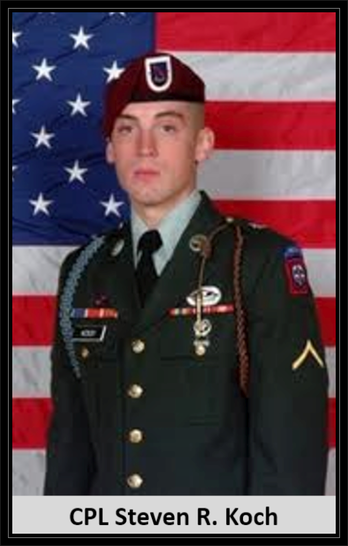 Corporal Steven R. Koch died on Monday, March 3, 2008, while serving in the U.S. Army in the Sabari District of Afghanistan. He was 23. A Funeral Mass will be held at 10 a.m. on Thursday at Our Lady of Lourdes R.C. Church, 233 N. Main St., Milltown. Burial will take place at 2 p.m. on Friday in Arlington National Cemetery, Arlington, Va. Visitation will be on Tuesday and Wednesday from 2 to 4 and 7 to 9 p.m. at Selover Funeral Home, 555 Georges Rd., North Brunswick. Born in New Brunswick, Cpl. Koch lived in North Brunswick before moving to East Brunswick. He attended Our Lady of Lourdes School in Milltown and East Brunswick High School. He enlisted in the U.S. Army in March of 2006 and was a paratrooper in the 82nd Airborne Division. Cpl. Koch was predeceased by his grandfathers, William Koch Sr. and Robert Glassen. Surviving are his wife, Amy Bethany Koch of Spotswood; his daughter, Zoe Koch of Spotswood; his parents, William Koch Jr. and Christine Glassen Koch of East Brunswick; a brother, William Koch III of East Brunswick; a sister, Lynne Koch of Hackensack; his maternal grandmother, Gladys Glassen of North Brunswick, and his paternal grandmother, Marion Koch of North Brunswick. In lieu of flowers, contributions can be made to the Cpl. 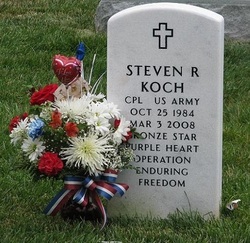 Steven Koch Fund, c/o William Koch Jr., 8 Garden Terrace, Milltown, N.J. 08850. Fallen Army Cpl. Steven Koch's hearse rolled slowly by Our Lady of Lourdes elementary school yesterday as pupils holding miniature flags lined the street in poignant tribute to the soldier, father and former student. Following the hearse past the silent wall of children at the Milltown school were Koch's teary-eyed mother, Christine, and his widow, Amy, each supported by friends holding their arms as they walked to the nearby Our Lady of Lourdes Church. The soldier's father, William Jr., brother, William III, and sister, Lynne, also participated in the procession with other relatives and friends as a solemn drummer from the Middlesex County Pipes and Drums corps beat a cadence and members of the 82nd Airborne Division, with whom the 23-year-old corporal had served, carried his casket into the church. "No man has greater love than to lay down his life for his friends. Steven showed his love by making the ultimate sacrifice," the Rev. Edward Czarcinski told the hundreds of relatives, friends, military veterans and well-wishers who filled the pews. "Steve lays in repose draped in the flag of his country, which he loved," Czarcinski said. Koch, who grew up in East Brunswick and had visited his former school just last year, was killed March 3 when a car bomb caused a wall to collapse on him in Sabari District, part of Khost Province in eastern Afghanistan, according to military officials. The region has been the scene of renewed fighting by the Taliban and other extremist groups. Koch was at least the ninth service member with New Jersey ties to die in Afghanistan since the war began. An additional 88 service members with ties to the state have died in Iraq. As the Koch family sat in the front of the church, a relative held the soldier's 15-month-old daughter, Zoe, who clutched a small American flag in her hand. "We pray for Zoe," Czarcinski said. "May she always be reminded of her dad's greatness, of her dad's sacrifice and her dad's love for her." Steven Koch decided to join the Army after the 9/11 terrorist attacks on the World Trade Center in 2001. His mother tried for years to keep him from enlisting, but in 2006 he decided he no longer would be stopped. 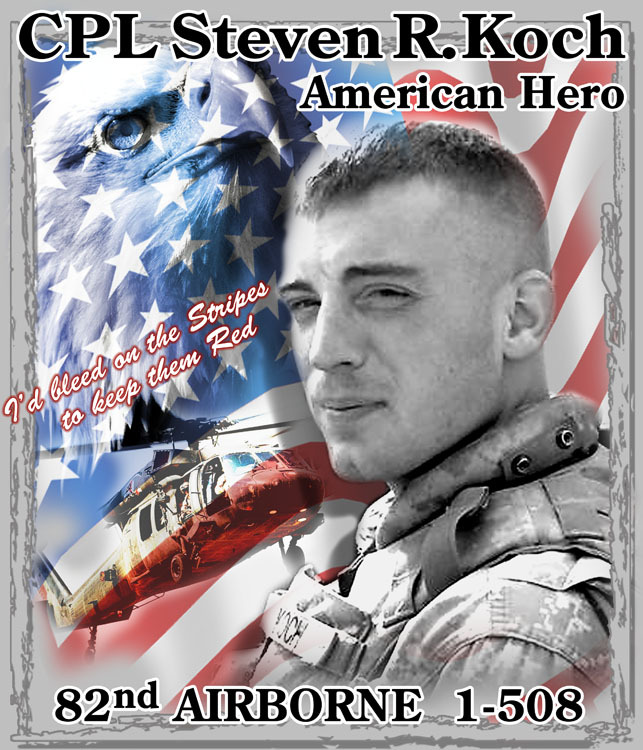 Koch was deployed to Afghanistan in January 2007 and was due to come home April 20. "I hope that five years from now," Czarcinski said yesterday, "when Zoe is going to school, we will be willing to lay down our lives, that the people of Afghanistan and Iraq will be free from war and death. We pray for peace. These are the beautiful ideals Steven believed." Relatives hugged and comforted each other as the pipes and drums corps played "Amazing Grace," a family favorite. For the final song, the choir sang "America the Beautiful." "What an honor for this boy to have so many people come out for him," said Elizabeth Gleason, who was one of Koch's teachers at Our Lady of Lourdes School and still works there. Gleason recalled Koch's smiling face when she taught him in a fifth-grade religion class. A fellow student of Koch's from that class sat behind Gleason at the church yesterday to pay his respects, while current seventh- and eighth-graders from the school also attended. "I think they will forever take this in their hearts," Gleason said. After the Mass, in a ceremony at the Joyce Kilmer American Legion Post 25 in Milltown, members of the 82nd Airborne Division presented Koch's parents, siblings and widow with medals for Meritorious Service, Good Conduct and the Afghanistan Campaign, all of which were awarded posthumously. The family also received commemorative coins from the 82nd Airborne Division and Gold Star lapel pins, which are given to relatives of soldiers who die in armed conflict. Today, the family will receive three more medals awarded to Koch posthumously -- the NATO, Bronze Star and Purple Heart -- when the soldier is buried at Arlington National Cemetery in Arlington, Va.